Tuition for all one hour classes is paid monthly at $63.00 per month. Additional classes are available at $57.00 per month. Registration is $40.00 per student. Click on the Class Names on the Left to see details and times for each level. An opportunity for 3 – 5 year olds to enjoy free expression with gymnastics movements and it’s apparatus. Students perform simple motor skills to help achieve better balance, coordination, body strength and total body awareness. These classes are designed for those who have mastered the basic Tumble Bug skills and are ready for a more formal and structured class. Boys and girls attend gender specific classes from this level on. These classes are by invitation only. Classes are offered for Boys 6 and older in a combined class. Classes follow USA Gymnastics recommended guidelines in developing skills for Level 1-4 gymnasts. Classes will improve overall strength, flexibility, and gross motor skills while utilizing all the men’s olympic apparatus and trampolines, tumble track, and safety pit to accomplish age appropriate skills. Classes follow USA Gymnastics recommended guidelines in developing skills for Level 1-4 gymnasts. 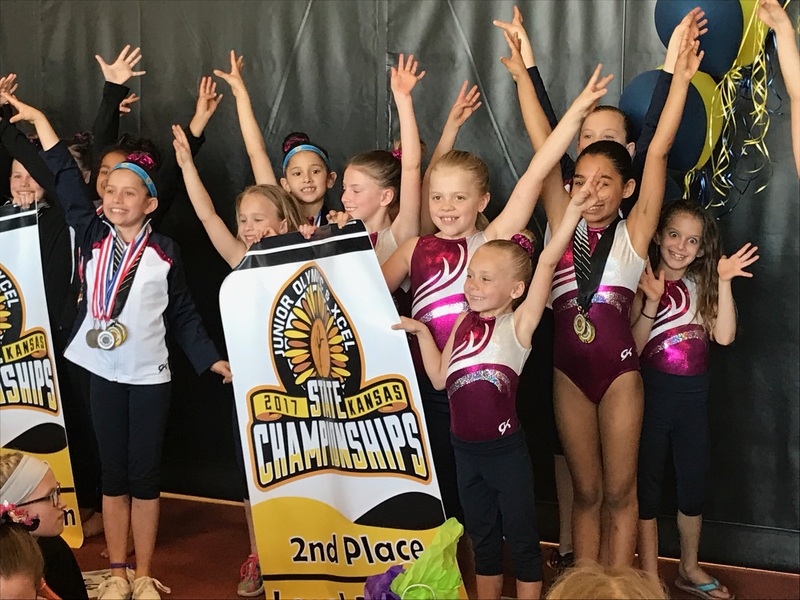 Classes will improve overall strength, flexibility, and gross motor skills while utilizing all the women’s olympic apparatus and trampolines, tumble track, and safety pit to accomplish age appropriate skills. This class is for boys and girls who want to only do tumbling. Trampolines, rod floor, spring floor, and safety pit will be used to safely progress in this class. Designed for gymnasts, cheerleaders, and yell leaders who want to improve basic to advanced tumbling skills. Trampolines, rod floor, spring floor, and safety pit will be utilized to achieve individual goals. Other apparatus will be taught if requested. Designed for the gymnast who desires more than one hour a week in the gym or has aspirations of becoming an age group competitive team member. Prerequisite skills are introduced and mastered in our Level 1-4 class program. These classes are by invitation only. These are competitive gymnastics levels. These levels are by invitation only.